James Lea and his team are learning about the significance of D’Arros and St Joseph for local shark populations – and how best to protect this critical habitat. The lagoon of St Joseph Atoll in the Seychelles is a crucial nursery habitat for several shark species. While the juveniles of some species shelter in the lagoon year-round, it seems that young grey reef sharks, such as this one, live in the shallows of the atoll’s outer reef. More than a thousand kilometres east of Africa, nestled within the vast Indian Ocean, lies a scattered archipelago of granitic islands and coral atolls: the Seychelles. The first recorded landing on the islands was in 1609 by the East India Company, passing by on international trade routes. Back then, the islands must have felt prehistoric, a primordial crucible boiling with life and ruled by ancient leviathans. Giant tortoises ambled across the rugged, harsh terrain and crocodiles lurked in the turbid coastal waters. Even dugongs, the alleged inspiration for mermaids among weary sailors, frequented the mangrove-fringed shallows. Early anecdotes refer to an abundance of large sharks; fishermen were stalked by hammerheads in the harbour, the burgeoning local turtle population was persistently harassed by hungry tiger sharks, and even great whites patrolled the inky depths. But such abundant life has proved ephemeral in the wake of human settlement. Demand for meat from locals and passing traders has reduced the Seychelles’ wildlife to a whispering shade of its former glory: crocodiles are now locally extinct, tortoises survive in only a few isolated spots and dugong sightings compete with a blue moon for frequency. Turtles were also hit hard, vanishing quickly as their meat and eggs were celebrated as local delicacies. But they were afforded full protection in 1994 and now the Seychelles once again hosts some of the largest turtle populations in the Indo-Pacific. Sharks, however, have received no such reprieve. Traditional fisheries persist, supplying local demand for shark curries and chutneys, and their activities are exacerbated by increasing shark finning that supplies markets in the Far East. The information available suggests catastrophic declines in shark numbers, with larger species proving increasingly rare – the last recorded sighting of a white shark was more than 50 years ago. Without some sanctuary, the outlook is bleak for sharks in the Seychelles. Yet all is not lost. Some refuges remain, providing piercing glimmers of hope for a broader recovery. One is the World Heritage Site of Aldabra, a large, isolated atoll that is protected from all fishing. It harbours an abundance of sharks, turtles, tortoises – and the last remaining dugongs in the Seychelles. Another is the comparatively small island of D’Arros and the associated atoll St Joseph in the Amirantes. St Joseph contains a shallow lagoon, no more than a few kilometres long, that can be accessed only at high tide. Although modest in size, such an access-restricted lagoon is rare and critical habitat in the Seychelles, providing sanctuary to a whole variety of sharks, turtles and rays, among other marine creatures. Unfortunately, D’Arros and St Joseph do not enjoy the luxury of protection that Aldabra does, and they continue to suffer fishing pressure. Although the occurrences are uncommon, boats have been recorded finning sharks even within the inner sanctum of the lagoon. This is a grave concern, as predators like sharks are highly valuable not only for ecosystem stability, but also commercially, in fisheries and tourism. Losing predators from an ecosystem can have devastating, unpredictable consequences on community structure, as prey species are released from both the pressure and the risk of predation. In order to appreciate the true value of D’Arros and St Joseph and how to best manage their biological wealth, it is first necessary to understand the behaviour and ecology of their inhabitants. James Lea has worked with sharks in locations across the Indian Ocean, but he thinks D’Arros Island and St Joseph Atoll could offer a special refuge for sharks. 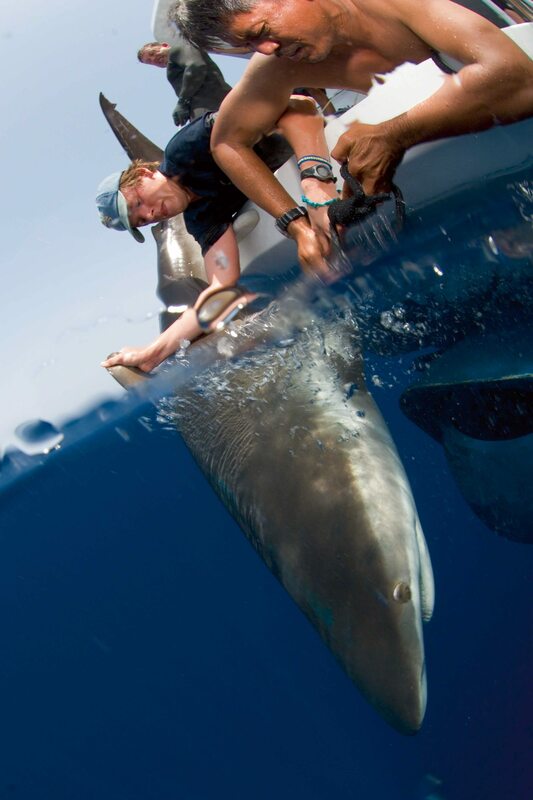 Here he tags and measures a silky shark in the Red Sea. In August 2012 D’Arros and St Joseph came under the management of the Save Our Seas Foundation (SOSF), with the explicit intention of safeguarding the health and stability of the local marine ecosystem. Just as it’s not possible to keep your car running smoothly without some idea of how it works, decisions about managing the marine environment have to be based on an accurate understanding of the ecosystem. Accordingly, the SOSF initiated various projects through the D’Arros Research Centre to study the behaviour and ecology of numerous species around D’Arros and St Joseph, with the ultimate aim of establishing a marine protected area (MPA). Within this broader remit I study the local sharks, which are of particular interest due to their important role as influential predators and the fact that this role is jeopardised by ever-present fishing pressure. The essence of my work is trying to discover which sharks go where, when and why. It sounds simple but, because of the concealing nature of the marine environment, we do not have even basic information such as this for most shark species. Understanding their movement behaviour is critical for evaluating how effective certain management measures, such as an MPA, might be. So my primary objective has been to track the long-term movements of as many different sharks as possible. This will help develop a comprehensive understanding of how the sharks use the varied habitats around D’Arros and St Joseph, and whether there are any particularly important areas or times on which management efforts should focus. So how do we find out who goes where, when and why? Logistically, sharks are somewhat difficult to follow and observe, so we have to adopt alternative methods. Fortunately, remote sensing techniques have developed to the point where we can follow the sharks autonomously – we just have to catch them first. This primarily involves a generous amount of patience, and perhaps a few too many biscuits. When a shark is eventually caught (typically interrupting biscuit consumption), the research team and I carefully bring it up to the surface. Once it is alongside our research boat, we roll the shark over onto its back, facing belly up. In this upside-down position the shark enters a trance-like state called tonic immobility, in which it ceases to respond to most stimuli. This biological quirk makes the subsequent work-up significantly easier for us and safer for the shark, as we then implant an acoustic transmitter under its skin. Each acoustic transmitter, or tag, continually transmits a unique identification code for up to 10 years, using ultrasonic pings. When the shark has been tagged and had its measurements and gender recorded, we roll it back over so that it can come out of tonic immobility and be released. As the tagged shark then moves around the islands, its unique code will be recorded whenever it passes one of the many underwater acoustic receivers we have deployed around D’Arros and St Joseph and across the Amirantes. When we then download the data from these receivers we can reconstruct the movements to discover where the sharks have been. number of sharks has declined drastically in other parts of the Seychelles, this island has been able to offer a partial refuge for sharks due to its remoteness. In this way, we are currently tracking more than 100 different sharks of various sizes and species, including blacktip reef, sicklefin lemon, grey reef and tawny nurse sharks, among others. To date we have more than two years’ worth of track data, which give us unique insight into the sharks’ private lives. One of our main discoveries is just how important the coastal habitats of D’Arros and St Joseph appear to be for these sharks. In particular, I can now identify the access-restricted refuge of the St Joseph lagoon as a crucial nursery habitat for several species: juvenile sicklefin lemon, blacktip reef and tawny nurse sharks shelter in the lagoon all year and for several years. The lagoon is an idyllic nursery for young, vulnerable sharks, providing both shelter from predators, because of the access-restricted shallows, and an abundance of prey, such as juvenile reef fish, rays and crustaceans. Although not in the lagoon, juvenile grey reef sharks appear to live just along the shallows of the atoll’s outer reef. This year-round residency of various shark species highlights St Joseph as an invaluable nursery, which may be critical for recruitment into the regional shark populations. In contrast to the tracked juveniles, the adults of most species tend to range more widely. For instance, we have recorded sicklefin lemon sharks moving to other islands up to 80 kilometres away from D’Arros, and adult grey reef sharks seem to range predominantly along offshore reefs. So how can we use these data to plan and inform potential management strategies? One way is to assess how effective certain MPA designs might be. D’Arros and St Joseph are relatively small and isolated, so it is feasible that an MPA of moderate size could be enforced with relative ease. Aldabra, the World Heritage Site with the most comprehensive protection in the Seychelles, possesses a no-fishing exclusion zone that extends one kilometre from the high-tide mark. Using this as a reference, a similar MPA at D’Arros would provide reasonable coverage of overall shark movements, ranging from 40 to 90%, depending on the species. However, the large reef flats associated with St Joseph mean that a boundary measured one kilometre from high tide would not even cover all of the lagoon, and wouldn’t fall far beyond the reef edge. Consequently the sharks, including the juveniles, would continue to cross the boundaries and remain vulnerable to fishing, even within the lagoon. To combat this, we tried setting the boundaries at one kilometre from the low-tide mark, when the reef flat is exposed, instead of the high-tide mark. Although it’s only a small variation in definition, it provides a large boost to the protection afforded: now 70–99% of overall shark movements would be encompassed by the MPA, with all tracked juveniles spending at least 95% of their time within its boundaries. However, the larger sharks tend to range more broadly so they would still be frequently exposed to fishing pressure, a risk starkly realised by the capture of a tagged individual 80 kilometres from D’Arros at the island of Marie-Louise. Consequently, any MPA must be coupled with broader fisheries management strategies, such as catch quotas, size limits and time/area closures, if it is to be effective. There would be limited benefit in protecting juveniles to maturity, just for them to be caught as they start to range more widely. Our work is ongoing and there is still much to learn, but it is becoming clear that D’Arros and St Joseph play an important role in the nursing of juvenile sharks to maturity and that this role is jeopardised by ongoing fishing pressure. Through the stewardship of the D’Arros Research Centre and the development of an MPA, D’Arros can become a true sanctuary for sharks in the Seychelles: a bastion from which a broader, regional recovery can be seeded, enabling the islands to aspire to their former majesty.